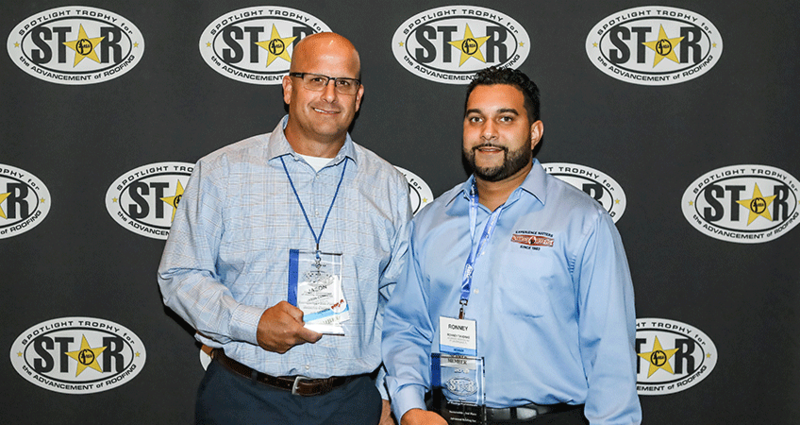 Advanced Roofing Earns Top Honors at the 2018 FRSA S.T.A.R. Awards - Advanced Roofing Inc.
Advanced Roofing Inc. (AR) is happy to announce that it recently earned two S.T.A.R. Awards from the Florida Roofing and Sheet Metal Association (FRSA) at the 96th annual convention and expo in Orlando, Florida on June 29th, 2018. The FRSA S.T.A.R. (Spotlight Trophy for the Advancement of Roofing) is an awards program designed to recognize association members for their unique and outstanding projects completed in Florida. ARI took home 3rd place honors in the Low Slope roofing category for its outstanding quality at the Aquazul Condominium in Fort Lauderdale, Florida, and 2nd place honors in the Sustainability category for its multiple solutions at the South Florida Regional Transportation Authority headquarters and tri-rail station in Pompano Beach, Florida. “We are honored to receive these two awards from the FRSA. It means a great deal to our team to be recognized among the top roofers in our industry” said Rob Kornahrens, president of Advanced Roofing Inc.
Aquazul Condominiums selected ARI to reroof their 15-year-old roof that was at the end of its service life due to granule loss caused by heavy foot traffic around the mechanical equipment. ARI faced several challenges when installing the roof system that included limited access to the loading area and safety concerns due to the extreme height of the building and approaching Hurricane Irma. To remedy these issues, ARI utilized its in-house crane division to help streamline production when installing the new roof at the 23-story premiere, luxury beachfront condominium’s 10,223-square-foot rooftop. The project highlights ARI’s unique capabilities to perform the entire scope of work during the re-roofing process. ARI completed the project safely, on time and on budget, all while satisfying the client’s needs and avoiding disruptions for the residents in the condominium. For the South Florida Regional Transportation Authority (SFRTA), Advanced Roofing was selected to install three roofs and a 226.8 kW solar canopy at the new headquarters and Tri-Rail station in Pompano Beach, Florida. The roof systems included a 40,000 sq.ft Fibertite single-ply roof on the main office and areas of the parking garage as well as a 30,000 sq.ft IMETCO structural standing seam metal roof painted with a custom, Galaxy Blue color on the train station. The project highlights ARI’s unique capabilities to perform both roofing and solar energy scopes of work while working under a fixed set of plans and a design-build project. The project was completed in July 2017 safely, and on time and within budget. For more about the FRSA, visit www.floridaroof.com. Subscribe to our newsletter and receive company news, roofing tips and more.